I like the idea that poetry is to be savoured. Perhaps that is why we toil over each poem, weighing every word and wondering whether the poem would still stand if it were removed? I can’t remember where I read about it but a prisoner was discussing the books that he read while serving a life sentence and he said that he read poetry, that poems got him through his incarceration. I can believe that. This led me to think about the pace of life today, has it become faster? My mother always maintained that life become faster as one aged. When I was young I was not sure, but I have to say Mum-you were right, it does! I think that we have more distraction today, more stimulation, thanks to the internet more access to books, music and films than we did even ten years ago, let alone a hundred or more years ago. Does this stimulation make life seem faster? Is it this access that makes things appear more disposable? Does it make us value the work of art less? I grew up in a small industrial town in the north-west of England, a town that could not sustain a book shop for longer than twelve months. Several people opened bookshops over the years and they all quickly closed. Thankfully there was the library. There was a record shop and, as I got older, I could order lps, on average an lp took four to six weeks to arrive. The shop stocked popular music but I wanted to hear the music I read about in the music papers. Today if I want a book I can download it to my Kindle, if I want music I can either download it or listen to it on Youtube. Does this instant access devalue, make us jaded? When my lp came I would listen to it repeatedly and read all the information on the record sleeve. I would savour the experience, rather like poetry, or a single malt. Does this instant access mean that we fail to see the work of art properly? Does it make a work of art more of a commodity? Does it mean that we do not spend enough time savouring works of art? Is that why we read poetry, because it requires more time and reflection? What do you think? To provoke or sustain in this rented room. So he watches the cars slide past in the night. For now he will shower off self doubt. His vessel too loose to hold. Hello, you may wonder why I am dressed as a carrot. I’d like to say that it is a long story then tell you some amusingly convoluted tale, but the reason is very simple. I was helping out my wife who is part of a team that have developed an app to help people to learn English. It’s called Word Carrot (hence the suit) and is available from I-Tunes. 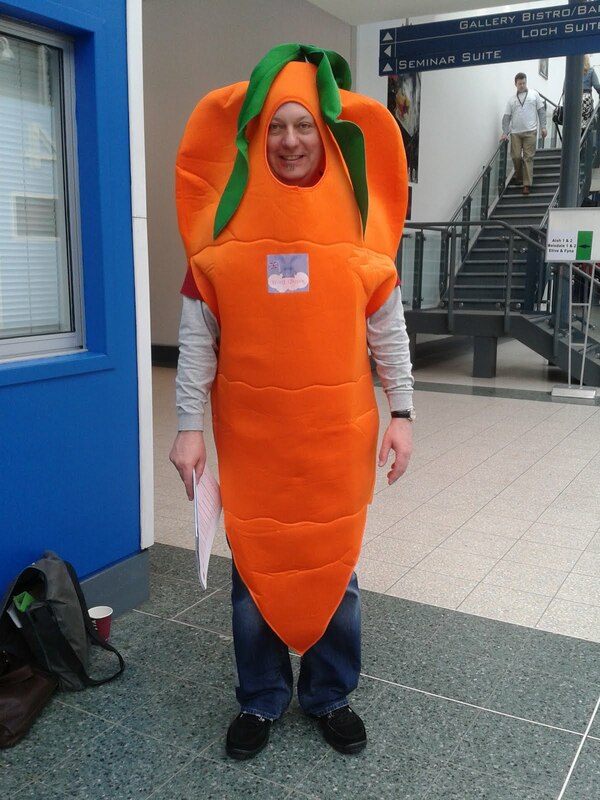 As part of their marketing campaign they needed someone to wear said carrot suit at a conference in Glasgow and I got the gig. What I want to share is people’s reaction to me in the suit. Most were curious and friendly, my mission, that I had chosen to accept, was to offer quiz forms for winning an Easter egg and tell people about the app. Many wanted their picture taking with a talking carrot. It was a pleasure to talk to them. Some, however, were incredulous that a grown man would wear a carrot suit and others commented that I must be being paid a great deal (I wasn’t, I did it for free). I was surprised by this small section of people and it made me realise that all of us are not the big show off that I am. I thought the idea of walking about dressed as a carrot was funny, and that it would be a hoot. It was. Have you ever done something that received mixed reactions? I’d really like to hear if you have. There was one song running through my head when I was a carrot, it was the Beach Boys singing Vegetables (it’s on the Smiley Smile lp and was part of the abandoned Smile project that recently was released). Here is a youtube link where you can listen to the song (http://www.youtube.com/watch?v=8T8mTW97UM4). I love it, happy listening. I’ll leave you this week with two questions: to echo Mr. Wilson, what is the name of your favourite vegetable? And do you know any other songs about vegetables? My computer crashed on Tuesday and it has taken until now for my computer wizard Greg to get it back on beam. Thank you Greg. I have no real idea what was up with it save it would not work. Yes I am that ignorant. This is a roundabout manner of explaining why I did not post on Tuesday. I want to ask a simple question today; do you write from life or do you make it all up? I have seen it recommended in writers handbooks that initially you should stick to writing about what you know. Is that what you do? I am not sure it is what I do all the time. When I was writing my novel I took care to ensure that, although it was set in a parallel world, the town where it takes place was based on somewhere I had lived. It seemed important to me that the characters walked down real streets. Author Haruki Murakami is famous for not giving interviews as he does not wish to discuss his life. I get the impression that he fears to talk about his own experience would somehow rob him of the raw material of his writing. In a way I know what he means. Sartre in his novel Nausea describes memories as being like recorded music, we compose an experience into a story, rather as musicians would record a piece of music. Every time we tell the story it is like playing the recording. The story we tell may have little resemblance to the actual event but it becomes our truth, our version of what happens. Murakami, I think, is concerned that his life experience stays flexible and so doesn’t give interviews. I read somewhere recently that being a poet begins with recognising that there are poems all around us. The knack is being able to make something from the experiences that swirl around us. That is where the real work begins. The following poem comes from a conversation I had with a friend of mine who was telling me about his experience of conscription in the 1970’s in the Netherlands. He had been an officer and he told me about one of his soldiers who had walked off the job, so to speak, one morning after guard duty. The trouble was he had an automatic machine gun with him. My friend was certain he had no intention of using it but it did cause a panic. As he told me this I could see the poem in my head. He left his post, just walked away. Worried on it until first light. Swept up in crisis, on the lam. Needed out the army, back to his life. Swore blind later, he’d hurt no one. Tasered him on the welcome mat. They thought he’d lied, of that no doubt. Ask him about conscription, he’ll say it’s a joke. What do you think? Does it work as a story and a poem? I’d been interested in your thoughts. MAGPIE BRIDGE IS A WINNER! I would like to thank the Golden Eagle (http://thegoldeneaglesblog.blogspot.com/2012/03/evil-genius-blogfest-winners.html) for hosting her Evil Genius Blog Fest I appear to be one of the three lucky winners along with EMILY ROSE of Mist of The Blossom Rain (http://mistoftheblossomrain.blogspot.com/) who was the winner of the popular vote and Sarah Pearson, who, like me, was a Random.org winner. Sarah’s blog is Empty White Pages (http://emptywhitepages.blogspot.com/). So I’d like to offer my congratulations to the other two winners and urge you to check out their blogs, they really are worth a look. I am a little late in telegraphing the good news as I have been away for a couple of days and only found out myself this morning. I shall put another post up on Tuesday. In the meantime, go and have a look at the other excellent boggers. I had a great weekend at Cardiff launching CO2. The prebook was very well received and we did brisk trade. Thanks to all of you who stood there listening to me rabbit on about the world of CO2. Corvus Press have put an album of the photos taken of the wonderful costumes on their Face Book (http://www.facebook.com/profile.php?id=100001222271209) page, it’s well worth a look if you have the time. I believe there are even more photos to come. I have been asked when CO2 will be available on line, I can say, to paraphrase the great Sam and Dave: “Hold on its coming.” I am assured it will be available in the next four weeks. I shall keep you posted. I was at a reading at my local theatre last night and it emphasised what I had been thinking at Cardiff, namely just how creative we humans are. Over the course of two hours we were entertained by a succession of different poets, whose styles and topics covered the spectrum of human experience. In this Taunton is not unique, such things happen all over the country, all over the world. Jaki Florek, an author from Widnes, which is where, as diligent readers of this blog may remember, I grew up, published an oral history of music making in that town Bridge Over Muddy Waters. I have just done a quick web search and it appears to be out of print, tragic, as it is such an interesting read. She also published a book about Erics, a punk club in Liverpool, where I used to go in 1976/7. These books, if you ever get to read them, underline my point, people are creative and we should celebrate that fact. How do you use your creativity? Here is a poem I wrote for homework in my creative writing class. The brief being sculpture. I’d been rereading Puck of Pook’s Hill by Rudyard Kipling, as the title suggests. Again if you did not read this book as a child, it’s not too late. In their swift arc to here from ape. To use for a second, then discard. Until what obsesses becomes clear. This scrimshaw will not outlast my death. Let me know what you make of this poem. I’d like to hear about how you express your creativity.